I’ve been experimenting a bit with the <canvas> tag. 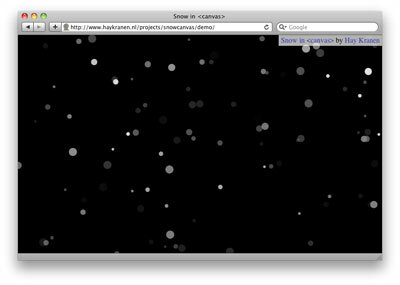 And hey, what’s a better way to use it right now than to make a browser screen full of snow? It even works in Internet Explorer (using excanvas) although pretty slow. For best results view in your favorite non-crappy standards compliant browser. View a demo here. And if you want to tinker with it, download the sources from Google Code (open source under the MIT/X11 license). Want to learn more about the <canvas> tag? Try this tutorial from diveintohtml5.org or the one from Mozilla.